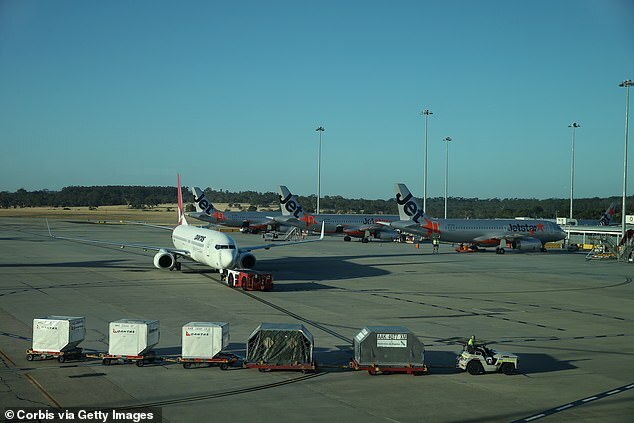 Melbourne’s Tullamarine Airport was descended into chaos after all flights were suspended on Monday morning. A fire alarm is believed to have gone off in the control tower, which led to an evacuation and mass delays. No planes were allowed to land at the time of the shutdown which forced inbound flights to circle the airport. The chaos comes as thousands of tennis fans have descended on the city ahead of the Australian Open which is due to begin on Tuesday. A spokesperson for the airport, told 3AW staff are now working to clear the backlog of delays caused by the mass suspensions. ‘Flights were affected, both inbound and departing,’ he said. Air traffic controllers have returned to the tower and incoming planes have been allowed to land.